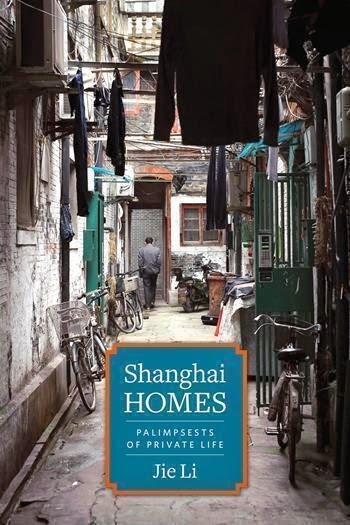 Last month I reviewed Shanghai Homes: Palimpsests of Private Life by Jie Li (Columbia, 2015) for the LSE Review of Books. It’s an excellent book and reading it elucidated and informed much of what I recall from many hours spent wandering through Shanghai’s shikumen lanes. It’ll be ten years ago this September that I first visited China. On my first visits to Beijing and Shanghai I became fascinated by the hutong and shikumen of each city respectively. Although distinctly dishevelled, dilapidated and run down to look at from the outside they seemed to have a distinctly homely air that hummed with the close-knit feeling of a genuine community. The 石库门 shikumen alleyways in Shanghai were we originally constructed by foreign owned factories to house their workers in the area of the city which was then known as the ‘International Settlement’ during the semi-colonial period of the city’s administration, from the mid-19th century up to the end of the Second World War and the subsequent Communist revolution. Beijing’s hutong in contrast have a much older heritage, dating back to the Mongol Yuan era in the late-13th century. The name, 胡同 hutong, derives from the Mongolian term (khôtagh) for a 'water well', suggesting a communal focal point for a set of family dwellings. I made several trips to Beijing and Shanghai between 2005 and 2010 working on several exhibitions in each city. A colleague and close friend of mine on our first few trips in 2005-2006 found a mutual affinity for wandering these old towns for hours on end whenever we could get a chance, either day or night. As we walked around these old areas we were struck by how often we were met with smiling faces. At first we’d both been rather timid, venturing into what felt like very intimate and enclosed spaces. The labyrinthine little alleyways were intriguing and unfathomable – entering one you never really knew if it would lead you through into another lane or if you’d end up inside someone’s house. Then turning a corner you might just as easily be met by the unexpected, I remember my surprise at rounding one corner to find an old Mosque (Xiaotaoyuan Mosque) suddenly looming up at the end of the lane. In other areas you’d stumble on a kerbside market, selling vegetables and cuts of meat, bustling with life. Motorbikes laden with clinking gas canisters trying to weave their way through the crowd. A game of mah jong being played at a table outdoors with a shrill horde of cheering onlookers, suggesting that the stakes of that particular game were riding high. People all around were out strolling, or sitting smoking, chatting. Proud grandparents showing off new born infants. Kids sprinting home from running errands to nearby food shops. Lines of laundry hung up high overhead, amidst skeins of telegraph wires, bridging the narrow alleyways. Songbirds occasionally singing out from elegant bamboo cages hanging in the shade of the upturned eaves. A bucket being filled from a spluttering faucet in an outdoor communal sink. A sudden waft of unsavoury air when passing the open doorway of a public lavatory. Bicycle repair shops busy with activity on the street corners. Open fronted shops with steaming pots boiling away on smoky stoves, selling dumplings and all sorts of snacks. There was always something to see. In writing the review of Jie Li’s wonderful book I went back to my old notebooks and photos, digging out the sparse diary entries I’d jotted down whilst on these first few trips to China, and looking through the photos and short films I’d made whilst wandering these back lanes. I remember a comment my friend made about how sad it was in some ways that this way of life was swiftly being swept away in the building boom which is the “New China” – but then again, these places have long been overcrowded and less than ideal. Things need to change perhaps, but, as Li’s book suggests, in losing the bad aspects often it's hard to hold onto and so transfer the good aspects, such as that close knit community feeling, into the new faceless anonymity of the high-rise blocks which are increasingly becoming the norm not just for China, but for so many cities in other parts of Asia too. After two weeks in Beijing just two nights in Shanghai is a complete contrast. Beijing, although massive beyond compare, is quieter and a lot more placid. Shanghai on the other hand is truly alive! Beijing is permeated with the military, the police, bureaucracy and regulation. Shanghai seems more open, more vibrant, and far more diverse. Wealth and poverty here stretch each end of the set of scales. Massive brand new skyscrapers have been built cheek-by-jowl to old shikumen lanes (Shanghai’s equivalent of Beijing’s hutongs) still packed with life, living, thriving, squalid but respectable and neat. Many of the old buildings in these shikumenlanes are marked with their numbers for demolition – but unlike the hutongs I saw in Beijing they still seem to function without care. The empty hutongsof Beijing which I saw were forlorn places, bereft of people and life [because many were in the process of being torn down in preparations ahead of the 2008 Beijing Olympic Games]. Here too there is all the Technicolor neon brilliance of somewhere like Tokyo, but also maimed beggars, many limbless and horrifically disfigured, missing eyes and wizened, weathered old faces. These are the two sides of China which I suppose I should have expected. Shanghai is perhaps the westerner’s most expected reality of Asia. Beijing is a grey utopia, popped out of the same mould as GDR-era East Berlin, and the Soviet Eastern Block. Beijingers seem laid back and accepting. Shanghai people either seem completely curious or utterly disinterested. Walking back to the hotel tonight we passed a spot where couples were dancing happily together in the street to music from a loud speaker. Unlike Beijing I don’t think I’ve seen a single military uniform here in Shanghai yet. I now have an altered impression of China as a country of contrasts. Shanghai is perhaps the ultimate city of total transition.